Area view of Montague Road in North Amherst. The building on the right is a sawmill once located on Eastman pond. It was first owned by Ansel Marshall, and later by Levi Dickinson. The first house on the left was the property of the Eastman family; the photograph was taken for Zebina Eastman in 1865. In the left background is a house and barns where Cowles Road is located. 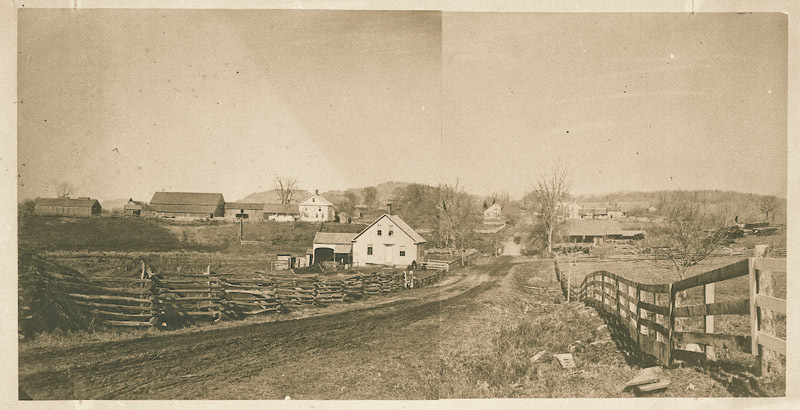 Lovell, John L., 1825-1903, “Area view of Montague Road in Amherst,” Digital Amherst, accessed April 22, 2019, http://digitalamherst.org/items/show/435.